Clean brushes for healthy horses! Horse Brushes are quite possibly one of the most collected, and frequently used tools in the barn. Whether your go-to brush is a synthetic mud brush or a natural fiber body brush, any brush is going to get dirty with time. Before you condemn you favorites to the bottom of the bag or worse… read on about how to clean brushes for the health of your horse and the longevity to your grooming kit! Do I really need to clean my brushes? Dirty brushes can harbor bacteria, fungus and creepy crawlies. 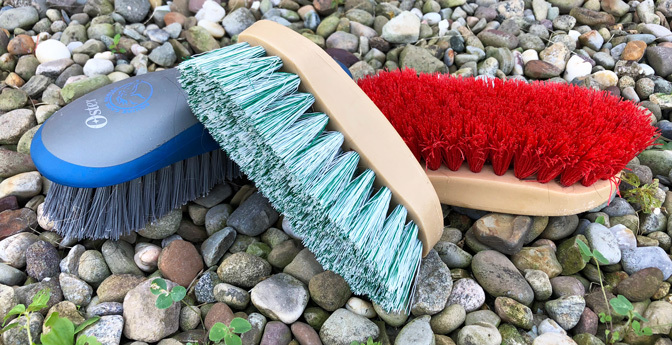 Not only are dirty brushes unsightly but they can also harbor fungus, bacteria and even creepy crawlies. Taking a moment to clean your brushes not only helps to extend their life, but also helps to ensure that your horse is getting the best and healthiest grooming possible. Plus it is really tough to get a horse really clean with a gross, dirty brush. If you are sharing brushes between horses, be sure to clean more frequently. If any horse starts showing signs of a skin condition, clean all brushes then and set aside specific tools to be used just that individual horse to help prevent cross contamination. When you favorite horse grooming brush is no longer fit to be seen around the barn, don’t despair, check out these handy tools to freshen up even the dingiest of brushes! 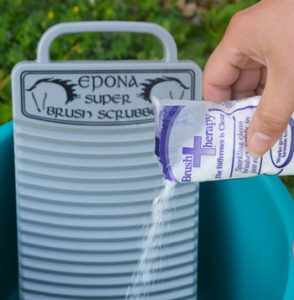 My tools of choice for scrubbing brushes are the Epona Super Brush Scrubber – this handy plastic washboard fits neatly into an 8 quart bucket. It features a comfortable handle and deep enough grooves to really open up and loosen deeply embedded grime. It can be used with any gentle cleanser or shampoo; however I’ve paired mine up with the Brush Therapy Effervescent cleanser for a supercharged deep clean. A little elbow grease… or not. The fizz from the Brush Therapy dissipates pretty quickly but the cleaning power was impressive. With a little elbow grease and the Epona brush scrubber you can achieve a deep down clean with just a few minutes on each brush. As an alternative to scrubbing, Brush Therapy suggests allowing the brush to soak for 8 minutes in their solution. With full synthetic brushes you can submerge them right in the bucket. If you have brushes that have leather or thin wooden backs, try using a shallow tray or casserole dish to allow the bristles time to soak and keep the backs from getting water logged. Brush Therapy even has a number to contact right on the packaging for help if you are unsure of how to clean a specific brush. Either way, once your brushes have been soaked or scrubbed, use a hair pick to remove any remaining tangled hairs or debris from the bristles. Finally, rinse them thoroughly with clean water, shake out the excess and allow them to dry out of direct sunlight. Don’t forget the curries! 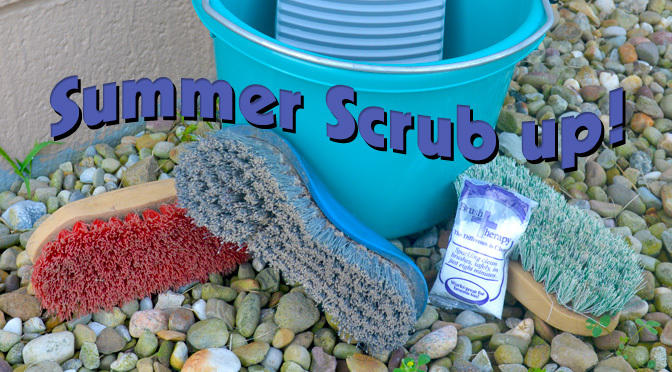 Rubber, plastic and metal curries can be washed in the same solution as your bristle brushes. Use a bottle brush to get into those hard to reach places around spring style metal and deep toothed rubber curries. 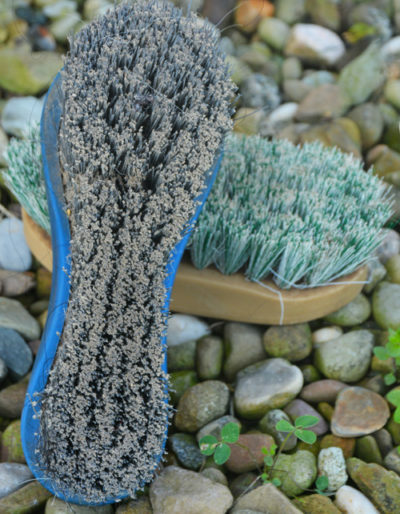 With these simple tools you are sure to extend the life of your brushes and have a happier healthier horse too!